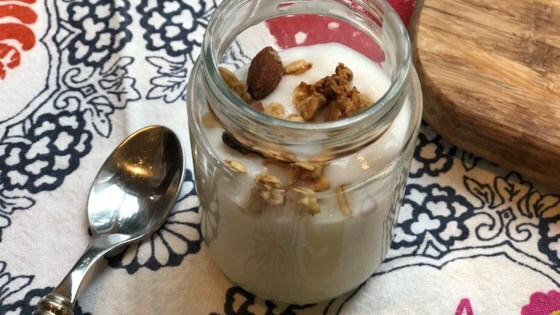 "Make this simple non-dairy homemade yogurt in your Instant Pot® with 2 basic available ingredients; you'll never buy yogurt again! Serve with honey and fresh fruit." Turn on a multi-functional pressure cooker (such as Instant Pot(R)) and select Yogurt function. Stir in soy milk and soy yogurt. Close and lock the lid. Set timer for 12 hours. Stir yogurt well and transfer to sealed jars. Chill in the fridge for at least 6 hours. You can use any non-dairy yogurt of your choice for this recipe.